Drunken Devil, an entertainment company with an emphasis on horror-infused nightlife events, dining experiences, and cabaret revues, is bringing a new show to Los Angeles with Night of 1,000 Devils. Damian Bloodworth is the first character to be unveiled, and holds a special place in Dorado’s heart. As the primary antagonist of his first public haunted attraction, The Nightmare House, in Santa Barbara, circa 2013, the character was originally conceived as the leader of a deranged, backwoods, cannibalistic cult. Now, Damian has become a Los Angeles nightcrawler whose vices include cocaine, champagne, and nocturnal, underground occult activities. In the new mythology, the 1,000 Devils is a small, sadistic cult, created by Damian when he met the Drunken Devil in limbo after a drug overdose. In exchange for survival, Damian gave up his mortal soul, and is now forced to offer an innocent victim as a ritual sacrifice, once a year, on the Night of 1,000 Devils. Much like previous Drunken Devil events, the party itself is equal parts cabaret, immersive theatre piece, and terror-tinged soiree. Guests will indulge in an open bar, featuring special craft cocktails as well as beer and wine. Throughout the evening, a series of acts will occur, including dark burlesque by Scarlette Fox, Olivia Bellafontaine, and Lily Faye, and, new to the Drunken Devil stage, Heather Horror [Lost Angels] and international superstar, Miss Miranda [New Orleans Burlesque Festival, House of Red Velvet], along with other surprise performances. Magician Jimmy H will once again return to mystify guests, along with a host of fortune tellers and tarot card readers. To end the night, dublab DJ Dirty Dave will close the evening with a set of dark disco. 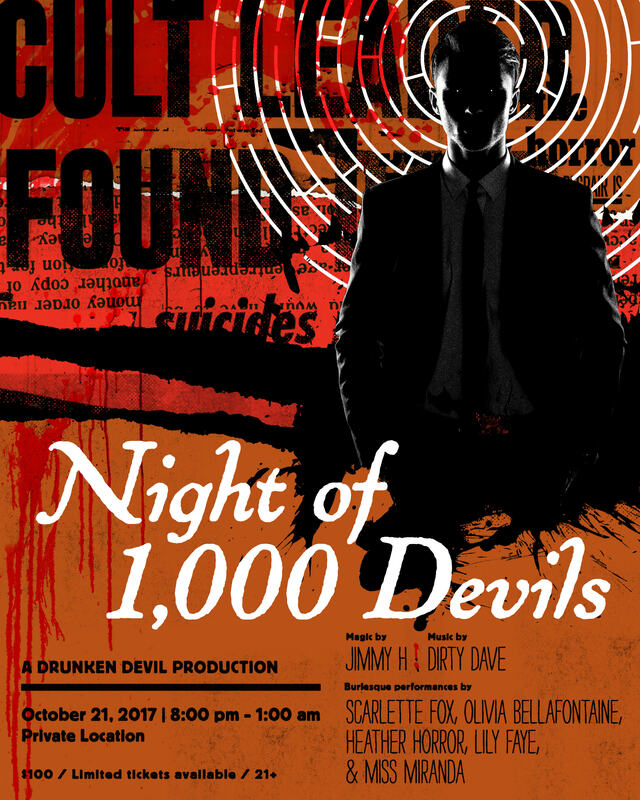 Night of 1,000 Devils will take place on Saturday, October 21. Doors open at 8:00pm. This intimate soiree is open to 100 guests only. Black formal attire is required. This event is strictly 21+ and will require guests to sign a waiver of consent prior to entry. Tickets for this event are $100. Private location will be revealed in the days leading up to the event.